Before we go any further, let me just clarify that I'm a huge Hulk fan. I own an unfeasibly large stack of Hulk trades, including all the Essential Hulks and Hulk Visionaries, and often get into debates about Sal Buscema versus Dale Keown. I nearly died of happiness when they finally collected all the Bill Mantlo run in trades. I end almost every conversation by saying "To Be Hulkinued," no matter how much that confuses people. And yet, I've come around to feeling as though the Hulk is better as part of an ensemble cast at the movies, and here's why. Bruce Banner's drama comes from the fact that if he loses control, he turns into a rampaging green beast. So he spends a lot of time trying not to lose control. That's good drama, right there — but Bill Mantlo, among others, delved into the idea that an abusive father and other childhood traumas were at the root of Banner's problems. (And that he was "always" the Hulk inside, even before he was exposed to Gamma radiation.) At its root, the Hulk's story is a psychological drama, and both films struggled to portray this. (Some of the most successful Hulk comics made liberal use of surreal dream sequences and intense weird visuals, to show the battle inside him.) Edward Norton apparently wanted his Incredible Hulk movie to be slow and talky, but all those sequences were cut before release. Ang Lee made the abusive father a main character, but crafted a self-consciously comic-booky story instead of going for psychological depth. You'd need a light touch, but also a willingness to get really dark, to capture the psyche of the Hulk on screen, and it seems to be a tough ask in a comic-book movie. I'm just guessing here, but the bean-counters at Marvel or any other studio are probably not going to rubber-stamp a budget of $150 million or more, after the character has already starred in two underperforming films. (And with VFX and other costs inevitably going up over time, $150 million would probably be low-ball to begin with.) Plus if anything, another Hulk movie needs to have a bigger budget than the previous ones — creating a motion-capture Hulk, based on Mark Ruffalo's performance, is a painstaking process. And the main way that a third "Hulk" movie would have to stand out is showing us a lot more of the Hulk — the first two movies rationed Hulk appearances as if they were a scarce resource, giving us just two or three rampages each. We barely got to spend any time just watching Hulk be Hulk. So if the next "Hulk" needed an even smaller budget, or even a flat budget, it might not be that satisfying. The Hulk is such a huge unstoppable creature, he's often at his best when he's the underdog. Or fighting creatures and forces that give him a run for his money. Put him up against a Wendigo, or Xemnu, or Wolverine (if only), or the Thing, and you get some good entertainment. Have him fight an unstoppable giant monster or an army of aliens, and you've got some excellent times. The Abomination is good for the occasional throwdown too, but he's not going to make the Hulk sweat. The Hulk needs more occasion to show us that the madder Hulk gets, the stronger Hulk gets. There's really one recurring Hulk foe who deserves a lot of screentime — the Leader, who's a super-genius whose brain was massively inflated by Gamma radiation. In the comics, the key to Samuel Sterns' psychosis is that he was an ordinary janitor with no great mental ability before he was exposed to Gamma rays, and he's constantly insecure and worried he'll go back to what he was. We already met Samuel Sterns in the Incredible Hulk movie... and he was kind of underwhelming. He's just another scientist who experiments with Gamma radiation. The film showed his forehead expanding after he's exposed to Banner's blood, setting up his appearance in the sequel, if any. But if another standalone Hulk movie did include the Leader, you'd want to do a soft reboot of some sort, to get the twisted, insecure Leader we deserve. The Hulk has already had two films (plus a few pretty fun TV movies.) Meanwhile, his cousin, Jennifer Walters, hasn't gotten so much as a motion comic, as far as I know. She-Hulk is one of the most compelling Marvel characters, because she's an attorney who often defends supervillains — and instead of turning into a rampaging monster, when she Hulks out she just becomes more reckless. She often does her lawyering in Hulk mode, but also goes out and gets into awesome brawls. We deserve a She-Hulk movie, and the Hulk could definitely play a supporting role. 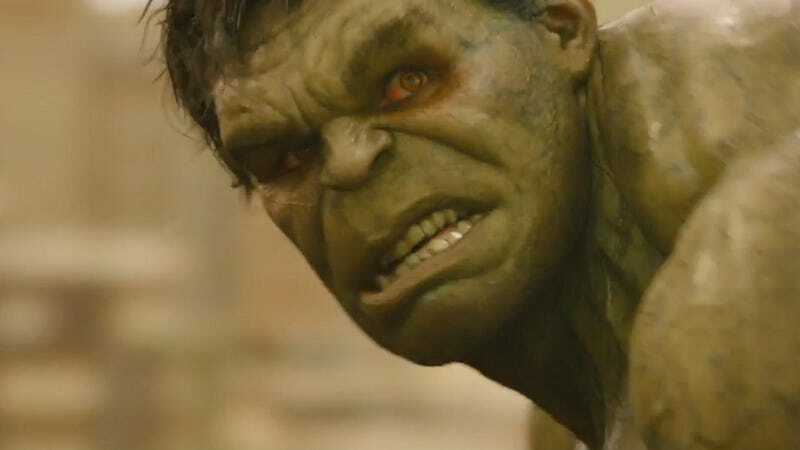 The main reason why I think a Hulk movie could work is simply Ruffalo's performance, which has all the repressed anger and potential violence, but also a lot of compassion and snark. The notion that he goes around being a doctor and helping people, and that his secret to not getting angry is that he's always angry, open up a lot of great territory for the character. I want to see more of that Hulk — and seeing a whole movie of Ruffalo's Hulk laying waste to everything and fighting everyone would be my jam. If only I could feel more confident that it would live up to my green-tinted dreams, for all the reasons mentioned above.